Cables must not be unraveled. 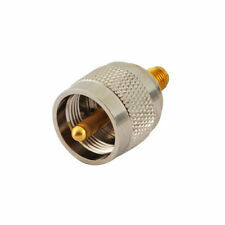 PL259 Solder Connector Plug Reducer is perfect for RG8X coaxial coax cable. Adapting reducer included in connector for use with RG8X. 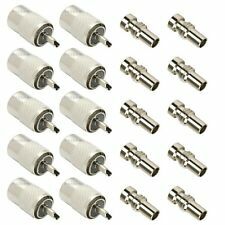 10 x UHF RG8X Connectors. Connector center conductor: Plug. Connector Material: Brass. This cable works great for ham radio, CB radio antennas, etc. • Fully molded nickel plated brass connectors. Also available 100 ft longhere. • 50 ohm impedance. WEATHERPROOF SEALED WITH ADHESIVE HEAT SHRINK. These adapters have a female UHF jack on one end, and a male BNC plug on the other. UHF PL-259 solder on connectors for RG8 coax cable plus UG-176 reducers for use with RG8X cable. Connector: PL-259 Male. Defective products can be changed during the warranty. 10 PCS Connectors. They are constructed of nickel plated zinc with nickel plated brass center pins and Bakelite insulators. RG142 double shielded Coax Cable. 10 feet. Price for 10'. I can cut for custom length. 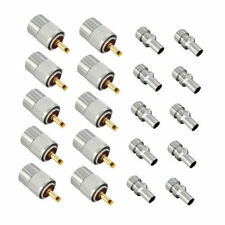 This sale is for a pack of ten (10) brand new, UHF PL-259 solder on connectors for RG8 coax cable plus ten (10) UG-176 reducers for use with RG8X cable. They are constructed of nickel plated zinc with nickel plated brass center pins and Bakelite insulators. This sale is for a pack of ten (10) brand new, UHF female (SO239) panel mount connectors with a 4-hole flange and solder cup (screws are not included). They are constructed of nickel plated brass with Delrin insulators. 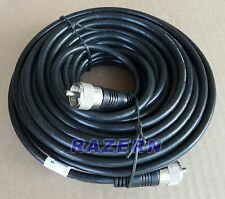 18' CB RADIO ANTENNA COAX CABLE. FOR SINGLE CB ANTENNA S0-239 STUD MOUNTS. RG-58A/U CABLE WITH MOLDED PL-259 CONNECTORS. EFFINGHAM RADIO REPAIR. g r 4 ( 78. OVER 20 YEARS EXPERIENCE. Super fast with order. ). 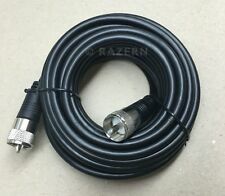 Easy to install RG8x coax cable. 5 x UHF PL-259 Male Solder on RF Connector Plug. They are constructed of Silver plated brass center pins and Teflon insulators. - Warranty: 2 years warranty from the dispatched date. Connector: SMA male on one side and N Male on the other. Length - 10 Feet. This sale is for a pack of twenty (20) brand new PL-259 (UHF) solder on connectors for RG8 coax cable, constructed of nickel plated zinc with nickel plated brass center pins and Bakelite insulators. 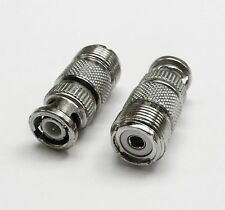 Note: These connectors are for RG8 coax cable with a 0.405" diameter and smaller diameter cable such as RG8X will require a reducer (not included). This cable works great for ham radio, CB radio antennas, etc. • Fully molded nickel plated brass connectors. 50 ft long. 100 ft long. • 50 ohm impedance. • Stranded bare copper center conductor. These UHF PL-259 crimp-type connectors, UHF PL-259 body and barrel are made to use with RG8, RG213, LMR400 or any other coax cables with similar OD. 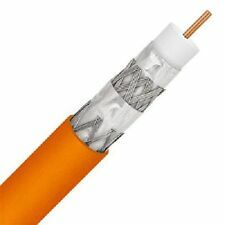 Cable Type: OD: RG8, RG213, LMR400 or similar. UHF PL-259 Male Crimp-Type Connector. 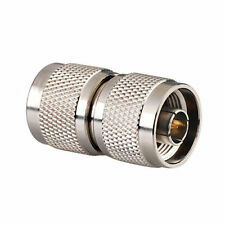 Connector: It uses the oxidation of copper SMA connector, 50 Ohm RP-SMA RP-SMA male and female. Wire: 50 ohms, wireless engineering dedicated wire. Using the machine of repression, work better. Color may be little different due to monitors. 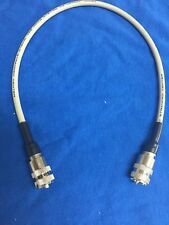 Connector: UHF SO239 on both ends. Connect 2 UHF Males. Great for many projects which involves UHF TYPE connectors. 4pcs UHF Connectors. Connector Size This is Military Grade Adapter. If you want the best, this is what you get. UHF PL-259 solder on connectors for RG8 coax cable plus UG-176 reducers for use with RG8X cable. Connector: PL-259 Male. They are constructed of nickel plated zinc with nickel plated brass center pins and Bakelite insulators. High Quality 10ft BNC Male to jack Extension Wire Power Cable Cord RF adapter pigtail RG174. 1pcs BNC Cable RG174. Cable Type: RG174. Connector Type: BNC Plug,male pin to BNC Jack, female pin. - Warranty: 2 years warranty from the dispatched date. These connectors are popular for making RG-8X (mini8) jumpers for use in the radio shack. We don't simply send connectors in an envelope. We want you to know as much information as possible to help make quality, great looking, installations for many years of trouble-free service. For RF coaxial cable: RG58 RG142 LMR195. 14mm 18mm Male Female Glass Adapter Joint Slide Bowl Extension various size UE. Hood Release Latch Handle Repair Kit Aluminum Black For Honda Civic 1996-2011 US. RG8X (MINI 8). ASTATIC SOLDERED ENDS. 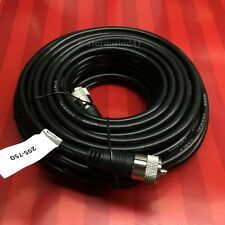 3` FOOT LONG CABLE. 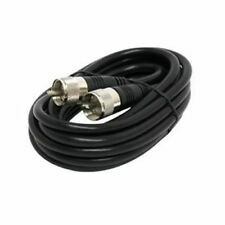 1x Antenna Extension Cable 10M. Length: 10M. Connector Type: RP-SMA Plug,female pin/ RP-SMA Jack,male pin. Ideal for extend the cable for installing the antenna to the ideal location. Cable Type:RG174. SMA Male to SMA Female. Conductor Material: Copper Clad Steel. Shield Material: Bare Copper Braid. - Warranty: 2 years warranty from the dispatched date. Features and Specs Survelliance Accessories. 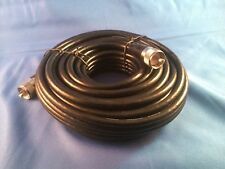 18 FEET ASTATIC 50 OHM RG8X 98% SHEILDED COAX JUMPERs. HIGH QUALITY HAND SOLDERED PL259 CONNECTORS. - PL259 Connectors. EXIT 160, I/57 & I/70. - 98% Shield. 98% SHIELDED FOR SIGNAL RETENTION AND. EFFINGHAM RADIO REPAIR. This is a 20 ft long RG-8X coaxial patch cable with UHF (PL-259) plugs on both ends. It works great with ham radios, CB radio antennas, and many other devices. Fully molded with nickel plated brass connectors. UHF Right Angle Adapter. End 1: UHF Female (SO-239). End 2: UHF Male (PL-259). Right Angle. Crimps to connector body & solder only the center pin. These UHF PL259 male crimp on connectors can be used with RG58, RG142, LMR195, LMR200, or any other coax cables with OD up to 5.25 mm. UHF PL259 Male Crimp On Connector. 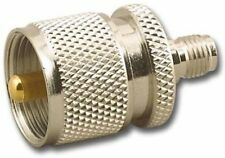 These N male crimp-type connectors, N brass body, gold plated male pin and barrel are made to use with RG8, RG213, LMR400 or any other coax cables with similar OD. Cable Type: RG8, RG213, LMR400 or similar, OD ~ 10.8mm or less.